Predators pose a threat to the Atlantic brant goose, making off with its eggs. 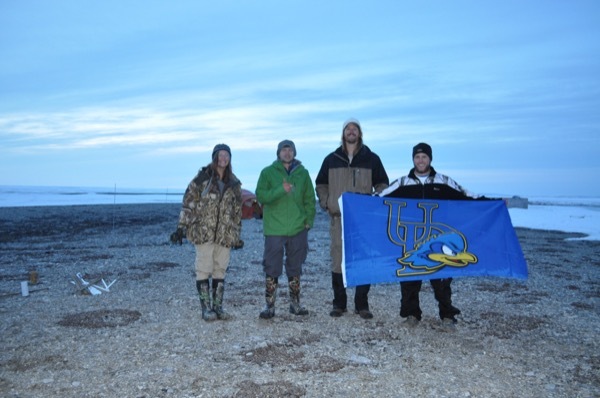 The UD research team shows the colors in the Arctic. The UD research team's camp. Access to the research area is via a plane fitted with skis. 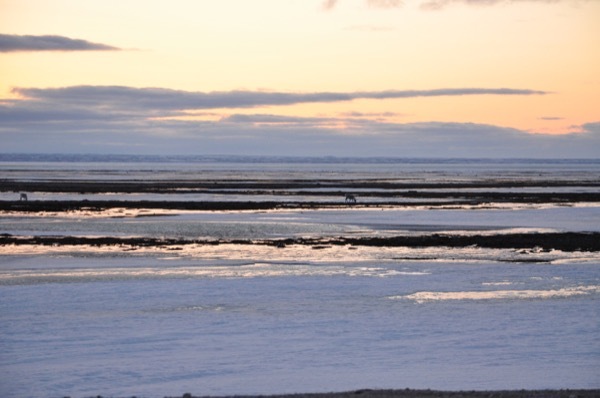 The Arctic landscape, site of Atlantic brant goose research. 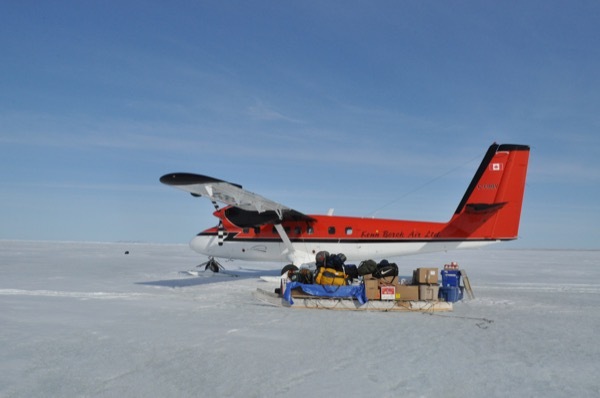 11:33 a.m., Jan. 26, 2015--Last summer, University of Delaware graduate student Clark Nissley and a team of three researchers studied the Atlantic brant goose in an area of the Arctic so remote that the only way to reach their camp was to fly in on a De Havilland Canada Twin Otter bush plane that had skis affixed to the bottom so that it could land on a sea ice runway. Nissley and his team braved the Arctic’s freezing temperatures on Southampton Island in Canada’s north Hudson Bay to gain a better understanding of several factors that could have an impact on the declining population of the Atlantic brant, including where they nest for the summer and whether other geese species, whose populations are increasing, could be negatively impacting the brants’ nesting success. The Atlantic brant population has been fluctuating and on a moderate decline for many years now and Nissley, a master’s degree student in the Department of Entomology and Wildlife Ecology, and Chris Williams, associate professor of wildlife ecology and Nissley’s adviser, are interested to learn if limitations during the summer breeding season have accelerated that trend. Over the last several years, biologists have seen that in winter surveys of Atlantic brant in the Mid-Atlantic, there are few young in the population, indicating that something could be going drastically wrong for nesting brant on their Arctic breeding grounds. The Atlantic brant have a lot of factors working against them. They are, Williams said, at an “evolutionary disadvantage compared to the other geese,” and that begins with their size. While nesting in areas surrounding the upper Hudson Bay, the Atlantic brant have to compete with much larger geese  snow geese and cackling geese  for habitat and food. And due to its size disadvantage, the brant arrives at its breeding grounds later than the other geese. While snow and cackling geese can build up fat reserves prior to making the trip north, enabling them to make fewer stops on the trip to the Arctic nesting site, the smaller brant have to stop along the way in order to feed and rebuild their fat stores. The brant arrive at their nesting sites a week and a half later than the other geese and instead of being able to immediately start nesting, they have to feed again in order to rebuild their fat stores for egg production and as a result miss out on the prime nesting real estate. “By arriving late, there is a possibility that prime nesting sites could have been taken and food resources could be degraded from all the other geese that have arrived. All of a sudden, there is a potential that the brant go into nesting at a disadvantage,” said Williams. Spending several months at the East Bay Bird Sanctuary located on Southampton Island, Nissley said that he and the team tracked 44 Atlantic brant nests over an eight-mile area of land from the beginning of May to July. 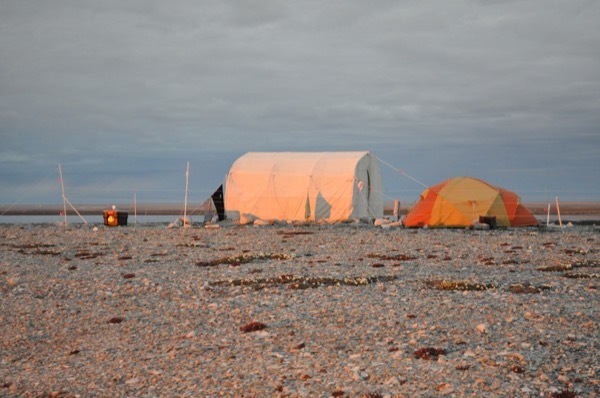 The crew would begin their day at 4 a.m., waking up in the 24-hour daylight, and head out to conduct their research at 5. “Everything involved hiking so we’d hike a couple hours to get to whatever we needed to do, whether it was sit in a blind for a few hours to conduct goose behavioral surveys, do a vegetation survey or do nest searching,” said Nissley. The researchers used blinds to research the behavior of the birds and did vegetative surveys at nest sites. In addition to the 44 brant nests, the crew located, marked and collected data on 530 cackling goose nests, 240 lesser snow goose nests and 50 Ross’s goose nests. They collected 100 measurements of vegetation at all 44 brant nests, 30 snow goose nests and 30 cackling goose nests to see how much of the habitat the geese share and look for trends to understand what sites are preferential to the brant and to the cackling geese. The crew also placed time-lapse and motion-sensing cameras on the brant nests to identify the exact cause of failure for the majority of the nests. The research is being conducted in collaboration with Ken Abraham, an adjunct professor at Trent University in Peterborough, Ontario, and a longtime waterfowl biologist who first set up a camp at the location in 1979. With 35 years of data, it is clear how brant populations have changed. The first year, 455 brant nests were observed by Abraham but this past summer Nissley and his group observed only 44. And of those 44, only two were successful. The 35-year data also shows how the habitat of the area has been degraded over time due to many factors, including the large number of snow and cackling geese in the area. When it comes time for the brant to nest, Williams said that there is competition with the other birds and predators that could keep the population from nesting to its fullest capability. Williams said that the other geese could pre-emptively eat available food resources or potentially be aggressive in interactions with the brant when it comes to food, which means there is the potential for brant to lose nutrition fitness for successful nest initiation, egg laying or personal health. Brant build their nests and their energy reserves in order to lay eggs. During this period, the snow and cackling geese could act aggressively, pushing the brant off of the best nesting spots, which in turn could lead to a reduction in nest initiation. Nissley said cackling geese seem to play more of a role than snow geese in pre-emptively excluding the brant from their preferred nest sites. 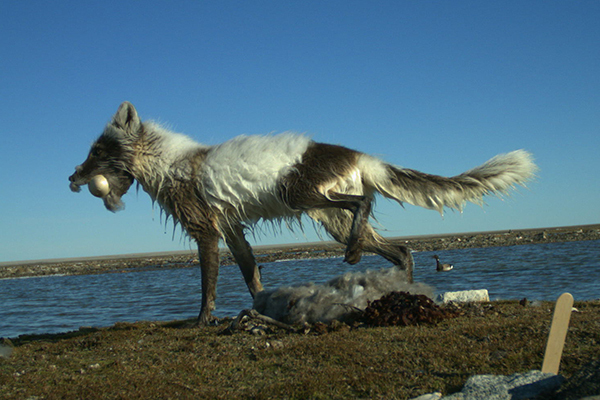 When the brant are forced to nest in lower quality sites due to competition, they are vulnerable to predators -- Arctic foxes, herring gulls and parasitic jaegers -- that prey on their nests during incubation or incubation breaks when the brant leave their nests to feed. The predators are potentially drawn to the nesting areas because of the influx of snow and cackling geese. “These predators might normally only affect the brant in low levels, but if high densities of cackling geese or snow geese draw these predators in, then the brant may be suffering secondarily as a result of it,” said Nissley. The research team is hoping to discover this summer if the high rate of fox disruption has anything to do with the cackling geese arriving first on the scene and taking the ideal nesting areas near deeper waters -- where foxes have a harder time gaining access – and thus leaving the more accessible and low quality nesting areas to the brant. Williams will spend a week in the Arctic this summer with Nissley as part of the study. The research is funded by the Arctic Goose Joint Venture and the Polar Continental Shelf Program, which is a division of Natural Resources Canada. Nissley has also received scholarships funds to help with the project from California Waterfowl through the Dennis Raveling Scholarship for Waterfowl Research and from Long Point Waterfowl through the Dave Ankney and the Sandi Johnson Waterfowl and Wetlands Graduate Research Scholarship.